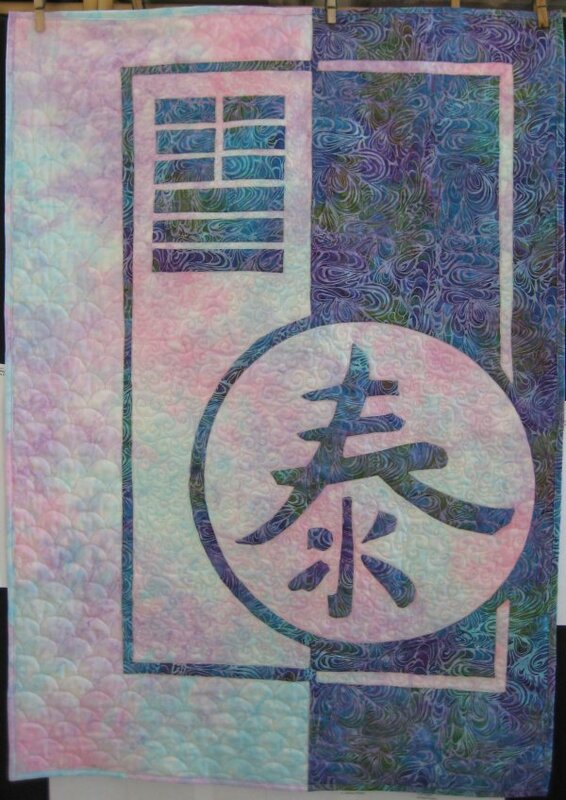 Originally, I made this pattern ("Peace", by Nancy Lee Chong of Pacific Rim Quilting Company) in August 2007. It was THE PATTERN where I learned the technique that convinced me that needleturn applique wasn't the devil's invention. 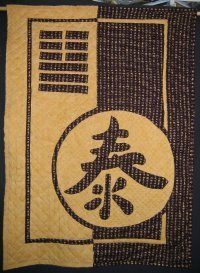 :-) Once I had Nancy's method mastered, it has been nothing but full speed ahead for me, in terms of needleturn applique! My oldest daughter claimed that original project; I was happy to give it to her. But, in the back of my mind, I really did want my own. So, in July 2012, I finally pulled the pattern out again, rummaged through my stash for appropriate fabrics (this pattern only takes two!) and made another one for me. But since I wasn't in a quilting mood at the time, the completed top was put in the pile with the other tops and was listed on the (infamous) List of 17 Tops. I've been steadily working through that (infamous) List of 17 Tops and, as a result, "Peace" finally popped to the top. Now the problem (for me) with doing a pattern a second time (or multiples) is that I get hung up on what I did for the previous version. I didn't want a duplicate; I wanted a *second* version! However, one thing that needed to be the same was stitch in the ditch around *all* of the appliques. This was absolutely, positively necessary to make the appliques stand out. I'm getting better and better at this stitch in the ditch with a longarm. For *me*, the procedure is to use a short straight-edge on straight lines and to go slowly. When I'm going around curves, because I don't have a micro-handle, I have one hand directly next to the needle, one hand on the handle and use the hand next to the needle to actually guide the machine around the applique. I have better control that way and the stitches are less likely to skedaddle away from me. But if they do (and aren't truly HORRIBLE), I'll let them go. *Because* .. typically, stitch in the ditch is done in matching thread to the background fabric, if you waver a bit from the edge of the applique, it really isn't going to show all that much. Besides, when you launder the quilt, the wrinkling will help disguise that waver .. so I just don't worry too much about slight deviations. Just like the story of not thinking of the camel's left knee, all I could think of how I quilted the first version. It's difficult enough for me to come up with an original quilting plan of attack for a single project .. now I needed something similar-yet-different for this one! The other background fabric was a full-length swath on the left-hand side. 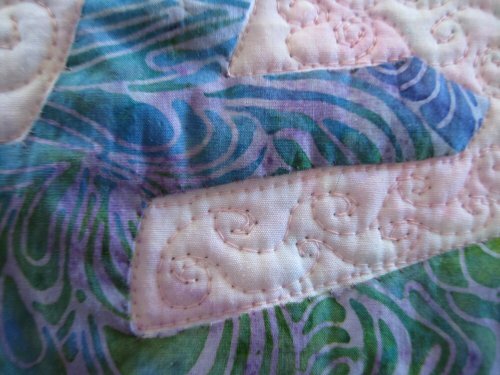 I didn't want to use the same curl-q swirl as I used next to the appliques. Instead, I used a traditional clamshell. 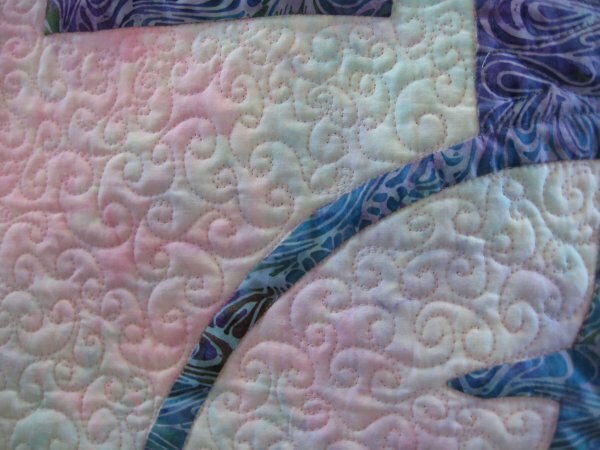 I did have one small, minor drama with this quilting ... I wasn't thinking of HOW this design needs to be stitched (which is bottom to top, because you build on the previous row). I was at the top of the wall-hanging and wanted to see how this design would look stitched out, so I stitched two rows *at the very top*. I was very pleased with the way the design came out but then ... duh duh duh .. uh oh. I realized that I really needed to start this quilting at the BOTTOM of the wall-hanging. But I had already stitched two rows at the top. (No, I was NOT going to rip that quilting out!) How on earth was I going to get the height of the rows to be quilted to work out so that they would EVENLY cover the space and match what I had already quilted??? Oy vey! Fortune was smiling on me: it worked out almost perfectly. There were a couple of rows that I needed to fudge on, but I bet you can't tell which ones they are? 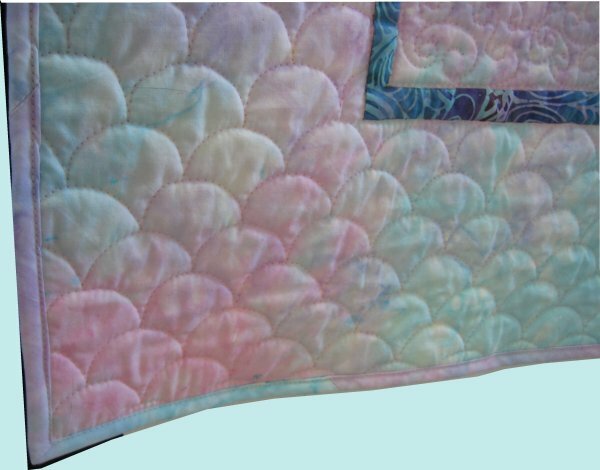 :-) I used a pastel pink thread for all the background quilting, as I wanted the color to disappear into the fabric and just leave the texture/impressions. That left just ONE MORE step .. the binding. Ya know, it's good to be a pack rat. Even though I had stitched this top nine months previously, I still had remnants of both fabrics leftover. This was *perfect* because I could use the background fabric to bind the background part and the applique fabric to bind the applique part! This would make the binding absolutely invisible and not a distraction from the applique itself. I even took the extra time and effort to seam the binding to match the seamline in the applique! But the binding process wasn't without it's own Drama. I knew that I needed to square up/trim the right side of the wall-hanging since the applique fabric didn't quite reach to the raw edge of the background fabric. Not a big deal; I simply drew a chalk line where I needed to trim it off. I also stitched a basting line over that chalk line to remind myself that when I got to that side, to use the basting stitches as the raw edge to align the binding to. Why didn't I just slice off that piece, next to the basting stitches? I haven't a clue. My brain must not have been engaged. So, I'm sure that you can figure out what happened when I approached that side .. yep .. I applied the binding to the real raw edge instead of the basting stitch "raw edge". Of course, I didn't realize that had happened until I had completely stitched all the binding in place AND seamed the binding to match the applique. AAAARRRGGGHHH!! There was nothing else to do but rip out that entire right side, slice off the extra fabric and restitch the binding. This resulted in the Second Drama (which I didn't even take a picture of, so use your imagination). I know I shouldn't sew when my brain is tired, even if it is just One More Step. Mistakes happen and sure enough .. that binding seam where the two ends were joined was HORRID. Oh. My. Gosh. The seamline in the binding was a good 1/4" offset from the applique seamline. Even a blind man would have been able to see it. There was nothing else to do but rip out that final joining seam and re-do it. But, I did re-do it and now it looks fine.